North Korea claims to have captured another U.S. citizen. 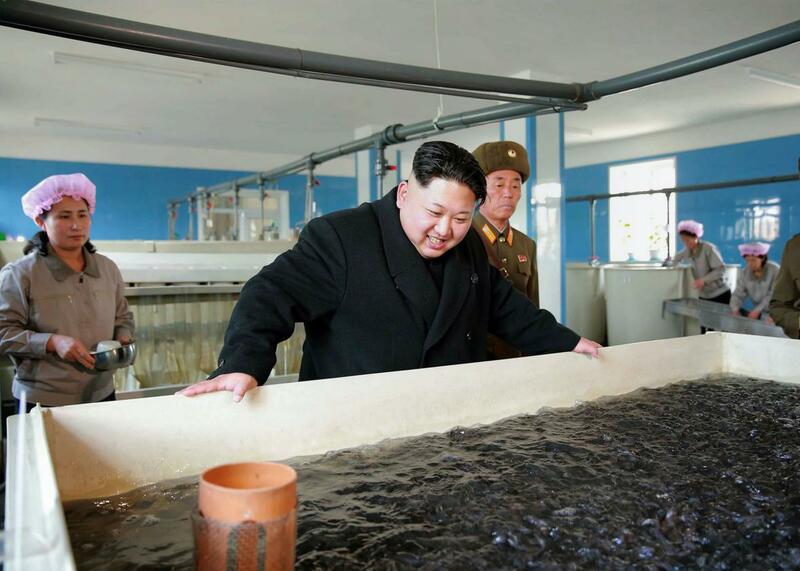 This undated picture released by North Korea’s official Korean Central News Agency on Dec. 12, 2015, shows North Korean leader Kim Jong-un inspecting the newly renovated May 9 catfish farm at an undisclosed location in North Korea. North Korea claims to be holding another U.S. citizen in captivity. The man in question, Kim Dong Chul, sat for an interview with CNN at a hotel in Pyongyang, the network reported on Monday. Kim, who claims to be a naturalized U.S. citizen formerly of Fairfax, Virginia, was “frogmarched into the room by stony-faced guards” according to CNN’s Will Ripley. The U.S. government has not yet confirmed Kim’s identity, but according to the prisoner, he had moved to Yanji, China, on the North Korean border, in 2001, where he traveled daily across the border on behalf of a hotel services company. He also said during the interview, under supervision by his guards, that he had been spying on behalf of “South Korean conservative elements” by “taking photos of military secrets and ‘scandalous’ scenes.” He was arrested last October on espionage charges. If the story is confirmed, Kim would be the first U.S. citizen held in North Korea since the negotiated release of missionary Kenneth Bae and tourist Matthew Todd Miller in 2014. Canadian pastor Hyeon Sol Lim, who was sentenced to a life of hard labor in December, was also interviewed by CNN over the weekend. North Korea’s announcement of Kim’s capture and reminder of Lim’s comes a week after the country made international headlines with a new nuclear test that it claimed—dubiously—was a hydrogen bomb. So what’s the regime’s angle here? Barack Obama took office pledging to seek more diplomatic engagement with hostile regimes, and has followed through to varying degrees with Myanmar, Cuba, and Iran. It’s been slower going with North Korea. Despite a few rounds of direct talks in 2011 and 2012, the country has shown little inclination to reform its human rights practices or give up its nuclear weapons program and has continually violated international agreements. The administration has attempted to approach North Korea with what Hillary Clinton, as secretary of state, called “strategic patience,” avoiding overreacting to the Kims’ provocations and refusing to grant major concessions while keeping the door opened to engagement if North Korea ever decides to make its own concessions on its nuclear program. As last week’s test showed, Kim Jong-un is not likely to give up his prized nuclear program any time soon. So taking U.S. hostages, then negotiating for their release, seems to be what North Korea would see as its only option at engaging with Washington. In securing Bae and Miller’s release, Clapper carried a “brief message” from President Obama. While the administration made clear this did not entail an opening in relations with the regime, it was at least an acknowledgment by the president of North Korea’s leader, and one made very much on Kim’s terms. It’s hard to describe a place as impoverished and isolated as North Korea as “successful” using the normal criteria we apply to countries. But North Korea can play a weak hand pretty well. This month alone, it demonstrated that despite international sanctions, it has continued to make progress on its nuclear program. The publicity surrounding its prisoners sends a message to Western powers, as well as China, where a diverse group of smugglers, spies, and missionaries bent on penetrating the Hermit Kingdom’s defenses operate. More importantly, it will likely force Washington to once again engage with Pyongyang on Pyongyang’s terms. By his own criteria, that’s a pretty good month for Kim Jong-un.